Now Offering Lighter Take Options! Enter to Win a Gift Certificate So You Can Try Them Yourself! As much as I like to cook, I love having an option for a great dine in or take out dinner. 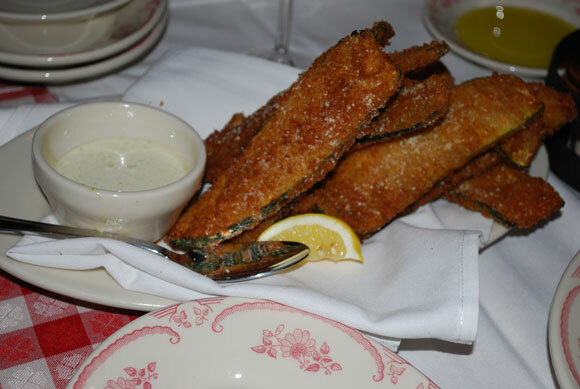 I've eaten at Maggiano's Little Italy Restaurants in several different states and was especially intrigued when I heard about their new Lighter Take entrees. 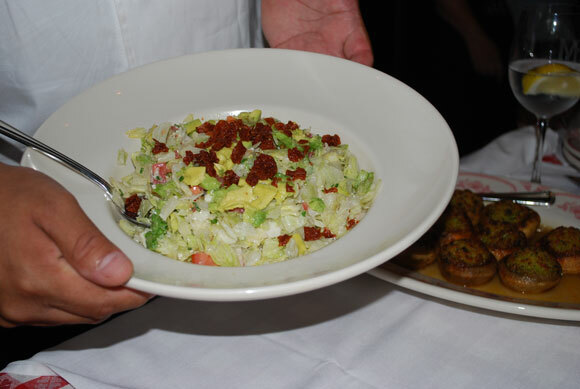 These are dishes that have all the flavor and generous portions that Maggiano's is known for with... fewer calories! As of July, 2014 there are seven Maggiano's Little Italy restaurants around the country that are offering these new Lighter Take options. I had the opportunity to taste some of them, along with other Maggiano's favorites, at the grand opening of the Vernon Hills, Illinois location. This is the only location in Illinois that will carry these lower calorie dishes until 9/8/14 when they will be rolled out around the country. I found eleven Lighter Take dishes on their menu, including the two pictured above. They were delicious! What I found interesting is that the portions on these lower calorie dishes are still generous, but the chefs use different cooking techniques such as grilling rather than frying and ingredient substitutions to keep the taste with around 1/3 less calories. These restaurants are located in 47 locations in 22 States and the District of Columbia. 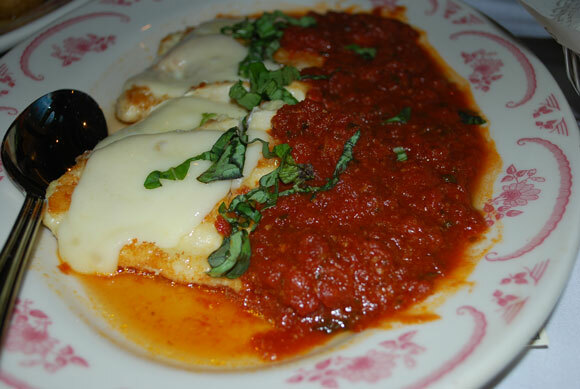 They are known for homemade classic Italian-American cuisine. In addition to dining in for lunch and dinner at these restaurants I have also ordered large pans of pasta from them when I've needed to feed a crowd or a traveling sports team. In my book they're known for their chopped salad but I have some new favorites now too! I couldn't stop eating their Zucchini Fritte with Lemon Aioli sauce. These were amazing and really quite irresistible! I also learned that their Rigatoni D is a dish that they recommend to people who are visiting this restaurant for the first time. 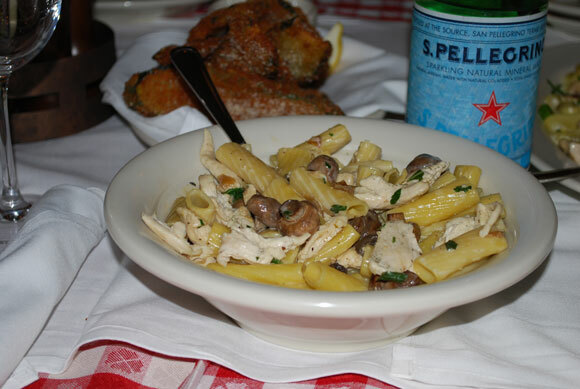 The chicken and pasta in this dish are tossed with a Marsala cream sauce that was delish as well. 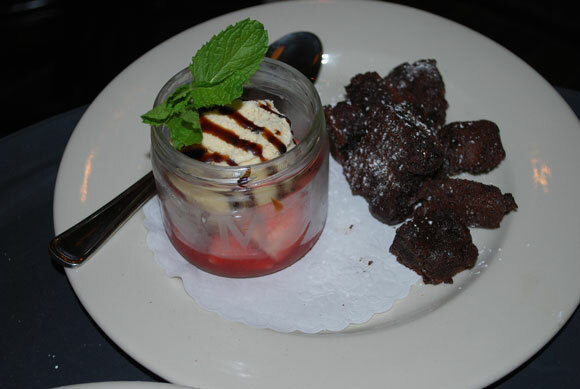 I have to say that their Double Chocolate Brownie Bites were a great way to end the meal. I did not have room to try the warm apple crostada with caramel sauce or the lemon cookies but they will definitely be on my list on my next visit! Enter for a Chance to Win a Maggiano's Gift Certificate! Now that I've made you hungry, you may want to try some of these delish dishes yourself. 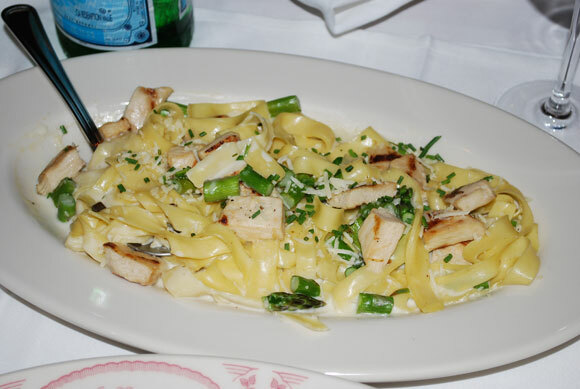 I'd love to send you a $25 gift certificate, compliments of Maggiano's. I have four (4) $25 gift certificates to give away to four (4) different people. Just enter below for a chance to win! The gift certificates will be mailed to four people who have been randomly selected from those that have entered this giveaway below. To enter you need to comment at the bottom of this page indicating what dish you would order at Maggiano's if you were selected to win. I reserve the right to delete any entries that include statements not in keeping with this giveaway. Bonus entries can also be earned if you follow Make Dinner Easy on Facebook and/or Twitter. This giveaway runs until 7/30/14. See link below for Terms and Conditions Best of luck!